Our optometrist Giles has a family rabbit, Patch who has developed glaucoma. Boroughbridge local vet, Julian Norton asked Giles to monitor Patch's eye pressure as the surgery don't have the equipment. During their discussions, they agreed the removing Patch's eye would be the best option and the director at Chanel 5's "The Yorkshire Vet" felt this would make an interesting story for a piece on the show....watch out for the story - hopefully featuring more of Patch and Giles' daughter Abi than Giles himself who feels he's better suited to our regular radio slot!! We were delighted to hear that Oliver - a member of the GB yachting team and sponsored by Christopher Nixon Optometrists - placed 4th in the recent World Championships held in Holland. Congratulations Oliver! 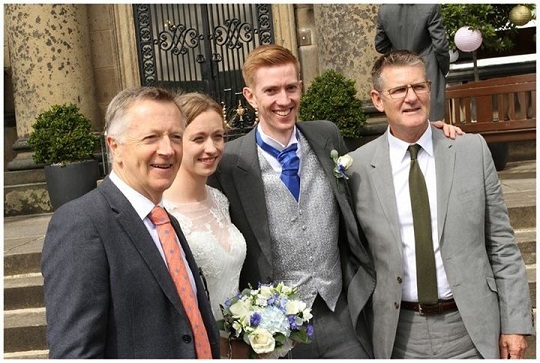 We are delighted to let you know that our Dispensing manager John has tied the knot! He an Maddy enjoyed a wonderful day at Denton Hall and we were priviledged to be a part of the celebrations. We are delighted to be sponsoring Oliver Kent in his quest to represent GB Sailing at future Olympic Games. Oliver and his family have been patients at Christopher Nixon Optometrists for a good few years and Oliver has been successfully fitted with EyeDream overnight wear contact lenses from No.7 Contact Lens Laboratory who have generously agreed co-sponsorship for the budding yachtsman. These lenses gently reshape Oliver's corneas overnight allowing him the freedom of corrected vision throughout the day and hopefully will contribute to his continued success on the water. Christopher Nixon Optometrists Facebook page presents some interesting articles, information and pictures of some of our latest frames. Click the icon or search for Christopher Nixon Optometrists on Facebook.